Borage oil is a rich source of gamma-linolenic acid (GLA), an omega-6 essential fatty acid (EFA) found primarily in plant-based oils. EFAs are required for many essential functions, but of most interest to athletes, they possess properties that may regulate hormones and stimulate metabolic rate. Although modern diets are generally 'top-heavy' with omega-6 linoleic acid (LA), GLA has different metabolic effects to LA, offering important health and performance benefits. Borage oil may help to enhance metabolic rate (fat burning) and support healthy hormone production (vital for muscle growth and strength) . This makes it extremely useful for anyone looking to lose body fat or build muscle and strength. Intense regular training may suppress hormone levels, while restricted calorie diets can lower metabolic rates (therefore making continued fat loss difficult). The EFAs contained in Borage oil may help to alleviate these problems and support training and physique goals. Some research also suggests that GLA supplementation supports general health and may offer alleviate a number of health conditions, including joint pain and arthritis. It is thought that GLA may enhance fat loss through two pathways. Firstly, some research suggests that GLA plays a role in activating the utilisation of 'dormant' brown fat stores for energy . Brown fat is often described as the fat that seems 'impossible' to lose for many dieters. It is possible that thin people have greater activation of brown fat, while overweight individuals have dormant brown fat. GLA may also elevate levels of the neurotransmitter (brain chemical) serotonin, a substance that contributes to feeling of satiety after eating. In theory, increasing serotonin levels may help reduce cravings for snacks and over-indulgence when dieting. Leading researcher Dr. Horrobin, concludes that GLA is "a safe, non-drug way to stimulate the body's metabolic activity and burn off fat" . The possible hormonal regulatory effects of GLA may be due to GLA's role in the production of Eicosanoids . Eicosanoids are thought to be important in the synthesis of virtually every hormone in the body. Consuming sufficient GLA may therefore be vital to the hormonal balance in the body. Hormones play a significant role in muscle growth, strength, wellbeing and health. Exogenous GLA converts predominantly into a substance called dihomogamma-liolenic acid (DGLA). This is in contrast to linoleic acid (LA) which converts more readily to arachidonic acid (AA). Excess AA is thought to increase inflammation, linked to a range of health problems and serious diseases. DGLA competes with AA and may help prevent the inflammatory effects that AA may promote. Reducing inflammation may be particularly useful to athletes who suffer from inflammatory conditions such as joint pain. For general health, an omega-6 to omega-3 fatty acid balance must exist (the ratio should be in the range of 1:1 to 4:1). 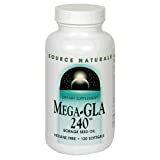 Studies suggest that up to 2,800 mg of GLA per day is well tolerated. It is recommended to consume GLA supplements with a good quality, combined omega-3 supplement. 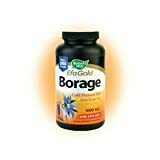 Borage oil and GLA supplements, support general health and well-being. They may alleviate a number of health conditions and possibly offer protection against a number of serious diseases, particularly when combined with omega-3 supplementation. 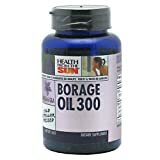 For general health, an omega-6 to omega-3 fatty acid balance must exist (the ratio should be in the range of 1:1 to 4:1), so it's a good idea to take borage oil in combination with long-chain omega-3 fatty acids. 1. IRCS J Med Sci 1979;7:52.Vaddadi K, Horrobin, D. Weight loss produced by evening primrose oil administration in normal and schizophrenic individuals. 2.Prog Lipid Res 1992; 31(2): 163-94. Horrobin DF Nutritional and medicinal importance of gamma-linolenic acid. 3. Biochemical Journal 1994; 299 (Pt 3):831-837. Liu S, Baracos VE, Quinney HA, Clandinin MT. Dietary omega-3 and polyunsaturated fatty acids modify fatty acyl composition and insulin binding in skeletal-muscle sarcolemma. 4. Nutrition Research 1995; 15; 211-219. Kruger MC. Eicosapentaenoic acid and docosahexaenoic acid supplementation increases calcium balance. 5. Clin Dev Immunol. 2004 Mar;11(1):13-21. Ziboh VA, Naguwa S, Vang K, Wineinger J, Morrissey BM, Watnik M, Gershwin ME. Suppression of leukotriene B4 generation by ex-vivo neutrophils isolated from asthma patients on dietary supplementation with gammalinolenic acid-containing borage oil: possible implication in asthma. 7. J. Nutr. 1997 127: 1435-1444. Margaret M. Johnson, Dennis D. Swan, Marc E. Surette, Jane Stegner, Tanya Chilton, Alfred N. Fonteh, and Floyd H. Chilton. Dietary Supplementation with Linolenic Acid Alters Fatty Acid Content and Eicosanoid Production in Healthy Humans. 8.Swed J Biol Med. 1986;4:8â11. Garcia CM, Carter J, Chou A. Gamma linolenic acid causes weight loss and lower blood pressure in overweight patients with family history of obesity.